Shiv Sena MP Ravindra Gaikwad, who is facing criticism for his alleged unruly behaviour with an Air India staffer, on 6 April arrived in the Parliament and is expected to share his side of story in front of the house. 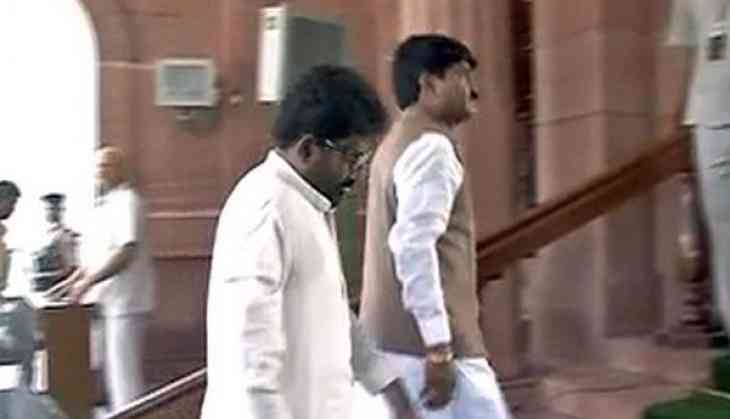 Shiv Sena leader Sanjay Raut backed Gaikwad and said that he won't run away and will speak on the matter on the floor of the house on 6 April. "Today there is a parliament session, he is in there and will keep his point of view in front of the house. Nobody from the Shiv Sena runs, Gaikwad ji will speak," said Raut. According to reports, Sena MPs will urge Speaker Sumitra Mahajan to allow Gaikwad to make a statement in the Lok Sabha to give his side of the story, which may include a denouncement of the attitude of Air India and private airlines, as well as the role of the Ministry of Civil Aviation, while demanding immediate revocation of his ban on boarding flights. The Shiv Sena MP from Osmanabad in Maharashtra has been banned by airlines after a ruckus with an Air India employee recently. Air India and six private airlines banned the 56-year-old MP from flying as he refused to apologise for the incident that triggered nationwide outrage.